Our home page frames Azimuth in terms of saving the planet. As I've said before, that is an overreaching statement. We really could use a more modest introduction. Comment Source:Our home page frames Azimuth in terms of saving the planet. As I've said before, that is an overreaching statement. We really could use a more modest introduction. To some extent, Azimuth is in the eye of the beholder. What follows is my interpretation of it. Comment Source:To some extent, Azimuth is in the eye of the beholder. What follows is my interpretation of it. Azimuth is an informal group of scientists, mathematicians, programmers and the like who are openly collaborating to understand environmental problems, along with the math, science and technology to support that understanding. Although the participants tend to be professionals, anyone who has an interest in these topics and a desire to help the planet is fundamentally welcomed. The participants generally have a shared interest in making change, but there are no prescribed views, and partisan politics are excluded from the agenda. This is a place to understand issues, rather than to fight them out. The latter also has its role to play, but elsewhere. We have a Forum, a Blog, and a Wiki. So come on down! Comment Source:Azimuth is an informal group of scientists, mathematicians, programmers and the like who are openly collaborating to understand environmental problems, along with the math, science and technology to support that understanding. Although the participants tend to be professionals, anyone who has an _interest_ in these topics and a desire to help the planet is fundamentally welcomed. The participants generally have a shared interest in making _change_, but there are no prescribed views, and partisan politics are excluded from the agenda. This is a place to _understand_ issues, rather than to fight them out. The latter also has its role to play, but elsewhere. We have a Forum, a Blog, and a Wiki. So come on down! I like the fact that Azimuth has a pledge to save the world. The blog I run, Context/Earth, has as a less noble objective to create and deploy simplified earth sciences models. I have no problem describing my objective in an elevator pitch -- that earth science is way too complicated and I am simply trying to reduce the complexity of current models. They typically understand what I am trying to do. but the response I always get is "Where's the money in that?" Comment Source:I like the fact that Azimuth has a pledge to save the world. The blog I run, Context/Earth, has as a less noble objective to create and deploy simplified earth sciences models. I started with four position papers, with the last describing the deployment: * http://contextearth.com/wp-content/uploads/2016/05/A-stochastic_analysis.pdf * http://contextearth.com/wp-content/uploads/2016/05/B-terrain_characterization.pdf * http://contextearth.com/wp-content/uploads/2016/05/C-diffusive_growth.pdf * http://contextearth.com/wp-content/uploads/2016/05/D-knowledge_based_enviromental_modeling.compressed.pdf and then there is the book length The Oil ConunDrum, which started me on the path * https://www.dropbox.com/s/l1z9esiukwkxjws/cdrum_issue2.pdf?dl=1 (download) I have no problem describing my objective in an elevator pitch -- that earth science is way too complicated and I am simply trying to reduce the complexity of current models. They typically understand what I am trying to do. but the response I always get is "Where's the money in that?" "The Azimuth Project is an international collaboration to create a focal point for scientists and engineers interested in saving the planet." Nad, fwiw due to eg. the radiation and other hardinesses of cockroaches etc I've had more than one person make similar objections. Richard Lindzen explicitly mocked the phrase 'saving the planet' on his Al Jazeera interview where Myles Allen was on the panel. I raised this infelicity a couple of years ago but John presumably thought this was too much of a nitpick and Nathan Urban didn't seem to think it mattered. Comment Source:Nad, fwiw due to eg. the radiation and other hardinesses of cockroaches etc I've had more than one person make similar objections. Richard Lindzen explicitly mocked the phrase 'saving the planet' on his Al Jazeera interview where Myles Allen was on the panel. I raised this infelicity a couple of years ago but John presumably thought this was too much of a nitpick and Nathan Urban didn't seem to think it mattered. I'd say the idea is at minimum to preserve the human race and help it flourish, and a maximum to do the same for as much of the remaining species as possible. But it really doesn't need a precise, legalistic definition. Human life, and the biological life that we consider part of home on earth, are in crisis. So "saving" these things can be interpreted in different ways, but what they have in common are getting through the crisis, surviving, and hopefully growing. Comment Source:I'd say the idea is at minimum to preserve the human race and help it flourish, and a maximum to do the same for as much of the remaining species as possible. But it really doesn't need a precise, legalistic definition. Human life, and the biological life that we consider part of home on earth, are in crisis. So "saving" these things can be interpreted in different ways, but what they have in common are getting through the crisis, surviving, and hopefully growing. This is more of an aspirational-emotional perspective than a mathematically defined objective. Put in other terms, I hope that my children will be able to have children, who in turn will be able to have children. And that the world that they are born into won't be biologically barren. I am not interested in making these statements more precise. They are hopes, which I, and our small group called Azimuth, are hardly in a position to determine. Comment Source:This is more of an aspirational-emotional perspective than a mathematically defined objective. Put in other terms, I hope that my children will be able to have children, who in turn will be able to have children. And that the world that they are born into won't be biologically barren. I am not interested in making these statements more precise. They are hopes, which I, and our small group called Azimuth, are hardly in a position to determine. "Richard Lindzen explicitly mocked the phrase 'saving the planet' on his Al Jazeera interview"
Following on my previous comment, Lindzen is an example of one of those earth scientists that thrives on creating overly complex models of the atmosphere. His generally accepted model of QBO is essentially an intricate narrative weave on how he thinks the atmosphere works and couched in lots of fluid dynamics math. In contrast, the work here and at Context/Earth unravels the mystery of QBO simply by signal processing the data and straightforwardly finding the correlations to the cause of the oscillations. One can just look at the data and imagine that the underlying phenomenon is probably not that complicated. That's what I can claim at least. Yet, what makes earth and climate sciences challenging is that there is no straightforward way to running controlled experiments and therefore to substantiate a given hypothesis. There is obviously no way one can run an experiment on the atmosphere or the ocean as a whole. I tend to believe that this shortcoming gives lots of earth scientists free reign to run wild and create overly complex models, with no checks and balances to verify that they are on the right path. I originally come from the experimental world and want to give an example of a controlled scientific experiment when I started out. This relates to the very popular Diamonds and Triamonds blog post that John has written. I started my grad studies working on the growth of epitaxial diamond and zincblende layers (Si, GaAs, etc). This was at the beginning of the nanostructure revolution where lots of people were working on quantum-well structures for all sorts of novel optoelectronic and high-speed applications. We had one of the early molecular beam epitaxy (MBE) systems produced out of the Physical Electronics division of Perkin-Elmer, which was located just down the road from us. One of the scientists working there, John Arthur, was formerly at Bell Labs and had worked with Al Cho to devise the prototype MBE chamber. An interesting oral history of MBE by Cho is here which is useful if you get puzzled as to what I am about to talk about next. Pretty soon after I started, our group was alerted to these strange intensity oscillations in the diffraction pattern observed while growing the epitaxial GaAs layers. The reason we could observe a diffraction pattern at all was due to the genius of Cho and Arthur, who figured that since they were growing these layers in an ultra-high vacuum chamber, why not stick a high-voltage electron gun in one port and attach a phosphor screen to the opposite side glass port and watch what is happening at the surface of the growing film (like a weirdly configured televison CRT). 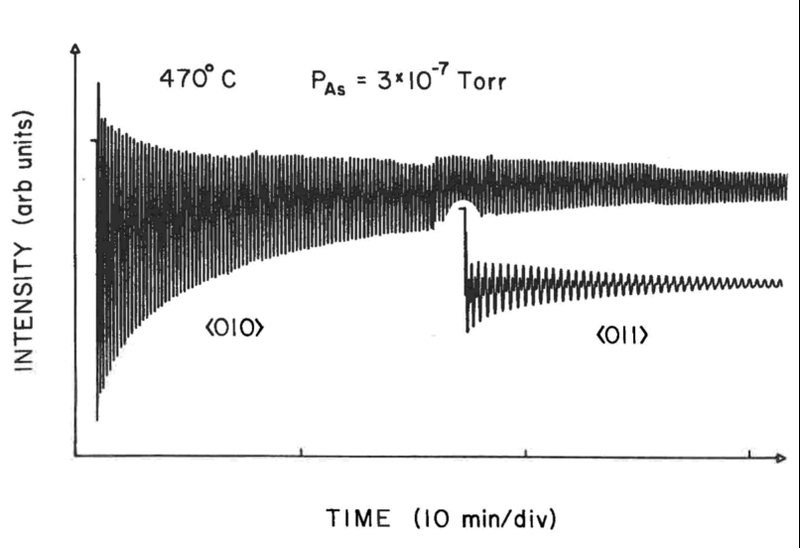 As it turns out many people had recalled seeing these oscillations (including as I recall John Arthur) but it took scientists Harris, Joyce, & Dobson from Imperial and Wood from Cornell to get the first peer-reviewed publications out. Trying to rationalize why colleagues had ignored the oscillations, many had thought that it was some artifact of the experimental setup, perhaps due to feedback control oscillations from the furnace generating the molecular beam flux. This happened to be the oscillations in a growing diamond-lattice germaniun layer in the presence of a background arsenic flux. In retrospect it was obvious -- deduced from a few controlled measurements -- as to what was going on. The oscillations were simply the result of interference in the electrons scattered from incompletely filled epitaxial layers. So what we were indirectly witnessing was the layer-by-layer growth of material, essentially a few angstroms of layer thickness per cycle. Read Cho’s history for his take starting on page 28. The key point to this story was that it took a few days to set up a controlled experiment to verify the hypothesis. All Harris et al and Wood had to do was perform a few growth experiments at different flux settings, and then measure the thicknesses of the grown layers via other means. This calibrated the growth period exactly to the flux rate, and then there was no doubt as to the interpretation. Now contrast how having a controlled experiment like I just described works out much better than NOT having a controlled experiment, as in the case of atmospheric QBO. Like the diffraction oscillations, they are readily apparent if you know where to look, but when it comes to interpretation, it’s a few days of detective work for the diffraction oscillations versus many years and possible still counting for the QBO. Lindzen's first interpretation was in the late 1960's with the first QBO measurements around 1953. There is no feasible way to adjust the parameters of the atmosphere, the mechanics of the Earth;s rotation, or the solar output to see if there are any causal interpretations to what we observe with QBO (or ENSO for that matter). All we are left with at our disposal are mathematical models of the behavior with possibly an assist from experimental verification at a scale orders-of-magnitude smaller than the observations. That's not to say that this makes it impossible to verify a cause in an earth science phenomena. Just consider the behavior of the ocean tides, where we have no means to change the orbit of the moon or the sun. Even though those are fixed we can still relate tidal frequencies to lunisolar frequencies based on years of self-consistent and therefore substantiating data. So its really about plausibility and parsimony for selecting a theory to explain a large-scale natural phenomenon. Is the model at first plausible (certainly the moon's gravitational pull can induce a tide) and then is it parsimonious (how convenient is it that the lunar cycles just happen to match the tidal cycles?). I claim that the plausibility of an atmospheric tide (caused by the moon and sun) and the parsimonious nature of aligning lunisolar cycles to the QBO time-series is enough to make our model much worthier than Lindzen's. Yet our work is still cut out for us, as there still isn't a controlled experiment to substantiate our claim and thus refute Lindzen's theory. But that being said, neither can Lindzen substantiate his own theory, for precisely the same reason. Thus I claim the simpler model should win out. That's the reality of observational disciplines such as astronomy and climate science. I would conclude that the marketing what we are doing here is only going to work if we have worthwhile ideas that we can advance. Comment Source:Jim said: > "Richard Lindzen explicitly mocked the phrase 'saving the planet' on his Al Jazeera interview" Following on my previous comment, Lindzen is an example of one of those earth scientists that thrives on creating overly complex models of the atmosphere. His generally accepted model of QBO is essentially an intricate narrative weave on how he thinks the atmosphere works and couched in lots of fluid dynamics math. In contrast, the work here and at Context/Earth unravels the mystery of QBO simply by signal processing the data and straightforwardly finding the correlations to the cause of the oscillations. One can just look at the data and imagine that the underlying phenomenon is probably not that complicated. That's what I can claim at least. Yet, what makes earth and climate sciences challenging is that there is no straightforward way to running **controlled** experiments and therefore to substantiate a given hypothesis. There is obviously no way one can run an experiment on the atmosphere or the ocean as a whole. I tend to believe that this shortcoming gives lots of earth scientists free reign to run wild and create overly complex models, with no checks and balances to verify that they are on the right path. I originally come from the experimental world and want to give an example of a controlled scientific experiment when I started out. This relates to the very popular [Diamonds and Triamonds blog post]( https://johncarlosbaez.wordpress.com/2016/04/11/diamonds-and-triamonds/) that John has written. I started my grad studies working on the growth of epitaxial diamond and zincblende layers (Si, GaAs, etc). This was at the beginning of the nanostructure revolution where lots of people were working on quantum-well structures for all sorts of novel optoelectronic and high-speed applications. We had one of the early [molecular beam epitaxy (MBE)]( http://www.sciencedirect.com/science/article/pii/0079678675900059) systems produced out of the Physical Electronics division of Perkin-Elmer, which was located just down the road from us. One of the scientists working there, [John Arthur]( http://de.wikipedia.org/wiki/John_R._Arthur), was formerly at Bell Labs and had worked with [Al Cho]( http://en.wikipedia.org/wiki/Alfred_Y._Cho) to devise the prototype MBE chamber. An interesting oral history of MBE by Cho is [here]( http://archive.computerhistory.org/resources/access/text/2015/06/102702406-05-01-acc.pdf) which is useful if you get puzzled as to what I am about to talk about next. Pretty soon after I started, our group was alerted to these strange intensity oscillations in the diffraction pattern observed while growing the epitaxial GaAs layers. The reason we could observe a diffraction pattern at all was due to the genius of Cho and Arthur, who figured that since they were growing these layers in an ultra-high vacuum chamber, why not stick a high-voltage electron gun in one port and attach a phosphor screen to the opposite side glass port and watch what is happening at the surface of the growing film (like a weirdly configured televison CRT). ! [rheed](http://imageshack.com/a/img921/8568/nnz0FB.gif) As it turns out many people had recalled seeing these oscillations (including as I recall John Arthur) but it took scientists Harris, Joyce, & Dobson from Imperial and Wood from Cornell to get the first peer-reviewed publications out. Trying to rationalize why colleagues had ignored the oscillations, many had thought that it was some artifact of the experimental setup, perhaps due to feedback control oscillations from the furnace generating the molecular beam flux. This is a classic example of a long-running growth oscillation I documented in [my thesis](http://books.google.com/books?id=QbKN59MGbrUC&printsec=frontcover#v=onepage&q&f=false) ! [osc]( http://imageshack.com/a/img921/9219/OXerj8.png) This happened to be the oscillations in a growing diamond-lattice germaniun layer in the presence of a background arsenic flux. In retrospect it was obvious -- deduced from a few controlled measurements -- as to what was going on. The oscillations were simply the result of interference in the electrons scattered from incompletely filled epitaxial layers. So what we were indirectly witnessing was the layer-by-layer growth of material, essentially a few angstroms of layer thickness per cycle. Read Cho’s history for his take starting on page 28. The key point to this story was that it took a few days to set up a controlled experiment to verify the hypothesis. All Harris et al and Wood had to do was perform a few growth experiments at different flux settings, and then measure the thicknesses of the grown layers via other means. This calibrated the growth period exactly to the flux rate, and then there was no doubt as to the interpretation. --- Now contrast how having a controlled experiment like I just described works out much better than NOT having a controlled experiment, as in the case of atmospheric QBO. Like the diffraction oscillations, they are readily apparent if you know where to look, but when it comes to interpretation, it’s a few days of detective work for the diffraction oscillations versus many years and possible still counting for the QBO. Lindzen's first interpretation was in the late 1960's with the first QBO measurements around 1953. There is no feasible way to adjust the parameters of the atmosphere, the mechanics of the Earth;s rotation, or the solar output to see if there are any causal interpretations to what we observe with QBO (or ENSO for that matter). All we are left with at our disposal are mathematical models of the behavior with possibly an assist from experimental verification at a scale orders-of-magnitude smaller than the observations. That's not to say that this makes it impossible to verify a cause in an earth science phenomena. Just consider the behavior of the ocean tides, where we have no means to change the orbit of the moon or the sun. Even though those are fixed we can still relate tidal frequencies to lunisolar frequencies based on years of self-consistent and therefore substantiating data. So its really about plausibility and parsimony for selecting a theory to explain a large-scale natural phenomenon. Is the model at first plausible (certainly the moon's gravitational pull can induce a tide) and then is it parsimonious (how convenient is it that the lunar cycles just happen to match the tidal cycles?). I claim that the plausibility of an atmospheric tide (caused by the moon and sun) and the parsimonious nature of aligning lunisolar cycles to the QBO time-series is enough to make our model much worthier than Lindzen's. Yet our work is still cut out for us, as there still isn't a controlled experiment to substantiate our claim and thus refute Lindzen's theory. But that being said, neither can Lindzen substantiate his own theory, for precisely the same reason. Thus I claim the simpler model should win out. That's the reality of observational disciplines such as astronomy and climate science. --- I would conclude that the marketing what we are doing here is only going to work if we have worthwhile ideas that we can advance. It's a meaningful aspiration, but if we pledge way more than we can actually deliver, it becomes rather easy to dismiss us as being merely dreamers. The best Azimuth introduction would strike the right balance between concrete projects that represent incremental contributions, and the deeper goals towards which we hope they will lead. This is no easy task, of course, and it will take work for us to reach that point of clarity. Comment Source:Returning to the topic of this thread... Paul wrote: > I like the fact that Azimuth has a pledge to save the world. It's a meaningful aspiration, but if we pledge way more than we can actually deliver, it becomes rather easy to dismiss us as being merely dreamers. The best Azimuth introduction would strike the right balance between concrete projects that represent incremental contributions, and the deeper goals towards which we hope they will lead. This is no easy task, of course, and it will take work for us to reach that point of clarity. Of course "saving the planet" is what the Brits call "over the top" - too grandiose. Of course people will start to argue with it, and mock it. That's fine. When people do, I joke that I'm not too worried about the Earth's core or mantle - it's the biosphere that concerns me. But when I chose that phrase I was just trying to honestly describe my motivations. The Azimuth Project is an international collaboration to create a focal point for scientists and engineers interested in saving the planet. Our goal is to make clearly presented, accurate information on the relevant issues easy to find, and to help people work together on our common problems. “Saving the planet” may sound pompous. But the very health of the planet is in peril because of the actions of humankind. Whether it is global warming, mass extinction, peak oil, or other problems, we need to be prepared on many fronts for an uncertain future. Our goal is not to replace or compete with existing sources of information, but to provide a bird’s-eye view of the information that already exists. We want to make it easy for any scientist or engineer to understand the whole problem and understand specialist literature in many subjects outside their particular domain of expertise. This emphasizes the goal of providing clear information, which is a big part of what we were trying do at the time. We were working very hard on the wiki, starting lots of articles. I'm not sure anyone is still actively interested in that. I think those of us who paid attention learned a lot about environmental problems and attempts to solve them. That phase is done. So, if someone wants to rewrite the home page, that's fine. I'm feeling too lazy to do it myself. John Baez, Network Theory (Part 1), 4 March 2011. John Baez, Azimuth News (Part 5), 11 June 2016. You could say this phase is drawing to a close as Jason and Brendan are finishing their theses. I guess Blake's thesis will round it off. I'm now almost ready to tackle little bits of biology. I want to spend some time this summer thinking about the distinctive features of the networks that appear in living systems. Also, in August I'll start a project with a company to develop operads as a methodology for "systems of systems". More on that soon. But for now I want to focus on doing actual work rather than writing manifestos. Furthermore, there are a lot of other branches to the Azimuth Project, like the El Niño Project, all the things Paul Pukite is doing, etc. So, I don't feel motivated to rewrite the Azimuth homepage. If anyone wants to, I can edit it! Comment Source:Of course "saving the planet" is what the Brits call "over the top" - too grandiose. Of course people will start to argue with it, and mock it. That's fine. When people do, I joke that I'm not too worried about the Earth's core or mantle - it's the biosphere that concerns me. But when I chose that phrase I was just trying to honestly describe my motivations. This is different than saying what we've actually done. That's why the Azimuth Wiki homepage says this: > The Azimuth Project is an international collaboration to create a focal point for scientists and engineers interested in saving the planet. Our goal is to make clearly presented, accurate information on the relevant issues easy to find, and to help people work together on our common problems. > “Saving the planet” may sound pompous. But the very health of the planet is in peril because of the actions of humankind. Whether it is global warming, mass extinction, peak oil, or other problems, we need to be prepared on many fronts for an uncertain future. > Our goal is not to replace or compete with existing sources of information, but to provide a bird’s-eye view of the information that already exists. We want to make it easy for any scientist or engineer to understand the whole problem and understand specialist literature in many subjects outside their particular domain of expertise. This emphasizes the goal of _providing clear information_, which is a big part of what we were trying do at the time. We were working very hard on the wiki, starting lots of articles. I'm not sure anyone is still actively interested in that. I think those of us who paid attention learned a lot about environmental problems and attempts to solve them. That phase is done. So, if someone wants to rewrite the home page, that's fine. I'm feeling too lazy to do it myself. These days my main goal is developing "network theory", as a step toward the grander goal of "green mathematics". My manifesto about those goals is here: * John Baez, [Network Theory (Part 1)](http://math.ucr.edu/home/baez/networks/networks_1.html), 4 March 2011. That was a long time ago. I've made a lot of progress since then. My students and I have put chemical reaction networks and Markov processes and signal flow diagrams and electrical circuits into a nice category-theoretic framework. The latest progress is summarized here: * John Baez, [Azimuth News (Part 5)](https://johncarlosbaez.wordpress.com/2016/06/11/azimuth-news-part-5/), 11 June 2016. You could say this phase is drawing to a close as Jason and Brendan are finishing their theses. I guess Blake's thesis will round it off. I'm now almost ready to tackle little bits of biology. I want to spend some time this summer thinking about the distinctive features of the networks that appear in living systems. Also, in August I'll start a project with a company to develop operads as a methodology for "systems of systems". More on that soon. But for now I want to focus on doing actual work rather than writing manifestos. Furthermore, there are a lot of other branches to the Azimuth Project, like the El Ni&ntilde;o Project, all the things Paul Pukite is doing, etc. So, I don't feel motivated to rewrite the Azimuth homepage. If anyone wants to, I can edit it! John, your points about Azimuth strategy are all well taken, and helpful in clarifying the goals of the project. But for now I want to focus on doing actual work rather than writing manifestos. This is also a useful point. Nevertheless, I do see a value in being able to clearly articulate a brief public statement about the purpose and contents of the Azimuth project. I know there are many, many more people who would be actively interested in Azimuth, if they only knew about it and understood the basic idea. Azimuth is an open, informal collaboration of mathematicians, scientists, programmers, and fellow travelers, working to understand environmental problems and the surrounding topics in math, science, and computing. Anyone with an interest in these topics is welcomed. Comment Source:John, your points about Azimuth strategy are all well taken, and helpful in clarifying the goals of the project. > But for now I want to focus on doing actual work rather than writing manifestos. This is also a useful point. Nevertheless, I do see a value in being able to clearly articulate a brief public statement about the purpose and contents of the Azimuth project. I *know* there are many, many more people who would be actively interested in Azimuth, if they only knew about it and understood the basic idea. Here is the brief public statement that I have come up with, and which will work for me at cocktail parties, etc: > Azimuth is an open, informal collaboration of mathematicians, scientists, programmers, and fellow travelers, working to understand environmental problems and the surrounding topics in math, science, and computing. Anyone with an *interest* in these topics is welcomed. By the way, I would love for you to rewrite the Azimuth homepage. I wasn't trying to say it's unnecessary. I just don't have the right kind of energy right now for that particular task. Comment Source:David wrote: > Nevertheless, I do see a value in being able to clearly articulate a brief public statement about the purpose and contents of the Azimuth project. I _know_ there are many, many more people who would be actively interested in Azimuth, if they only knew about it and understood the basic idea. By the way, I would _love_ for you to rewrite the Azimuth homepage. I wasn't trying to say it's unnecessary. I just don't have the right kind of energy right now for that particular task.